Big Moose Resort is the place to begin your wildlife viewing adventure! Located just 7 miles from the Northeast Entrance to Yellowstone National Park you’re just minutes away from the premier wildlife viewing & photography opportunities available in Yellowstone’s “Lamar Valley”. Many of our guests are up at the crack of dawn and most stay out until dark before returning to their cabins at the Big Moose. Timing can be everything when you’re waiting for the opportunity to see a Wolf, a Grizzly Bear or Black Bear, Moose, Elk, Rock Mountain Bighorn Sheep or Bald Eagle. Wildlife sightings aren’t limited to Yellowstone National Park! 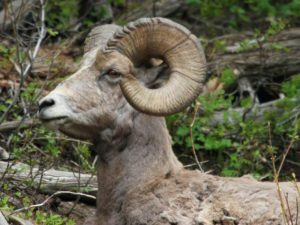 It is not unusual for guests to see wildlife in the Cooke City Area or within a few hundred feet of their cabins. Sometimes wildlife wanders onto the property here at Big Moose Resort, and you can take a photo right from the front porch of your mountain cabin! We always try not to disturb guests but we’ve been known to knock on cabin doors to make sure guests get to see a moose, bear or buffalo on the Big Moose property. This is Grizzly Bear Country! The Beartooth All-American Road will take you over the majestic Beartooth Mountains and into Red Lodge, Montana. The drive provides access to some of the most rugged and pristine wildlife watching areas in America. 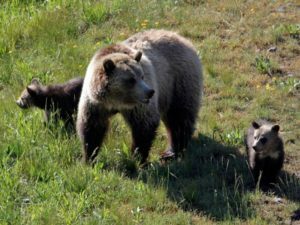 Another scenic drive through Crandall & Sunlight Basin via the Chief Joseph Scenic Byway may also provide wildlife viewing opportunities. Frequently, on trips to Cody, Wyoming, we see a bear. Our area has unlimited access to lakes, rivers and streams, both in Yellowstone National Park, and the Gallatin, Custer and Shoshone National Forests surrounding Big Moose. 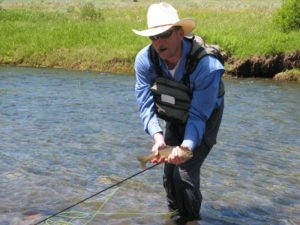 Yellowstone’s Lamar Valley is just 20 short minutes from Big Moose Resort and offers fantastic fishing in Slough Creek, Soda Butte, Pebble Creek, Hell Roaring, Lamar River, and Yellowstone Rivers. The headwaters of the Clark’s Fork River run within a mile of Big Moose and offer spectacular trout fishing. The Beartooth Mountain Ranges offer upwards of a thousand freshwater lakes, streams and rivers stocked with trout of all variety. Travel to the Sunlight Basin Rivers via the Chief Joseph Scenic Byway (Hwy 296) and fish in some of the most spectacular mountain waters in America. The scenery makes the fishing an unforgettable experience. Local outfitters are available for drop back country camps. The experience of a pack trip using horses to pack all your gear to the back country is awesome! So come wet a line and use Big Moose Resort as your base camp to experience it all!!! Contact any of these fantastic outfitters and they can set you up for the hunt of a lifetime! 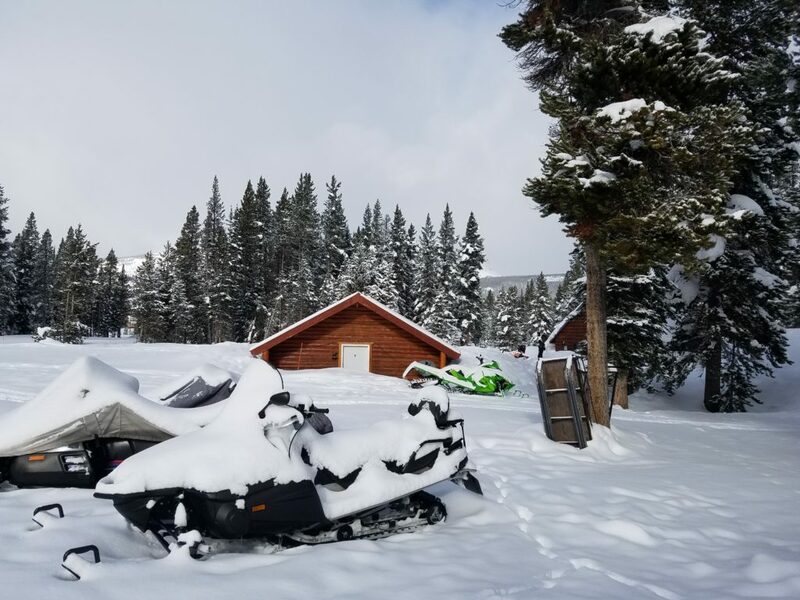 Big Moose Resort is centrally located for hiking in the Absaroka – Beartooth Wilderness, and the Gallatin, Custer and Shoshone National Forests, and provides easy access to Yellowstone National Park for the ultimate back country trek. Whether it’s a day hike or week long adventure, Big Moose is at the heart of hiking country. We once had a hiker who stayed in the mountains for 2 months – Wow! With easy access to trail heads via Hwy 212, the Beartooth All-American Road, or Hwy 296, the Chief Joseph Scenic Byway, it is only a scenic drive or short walk to begin a hike. Big Moose Resort is walking distance from the Clark’s Fork Trail Head! 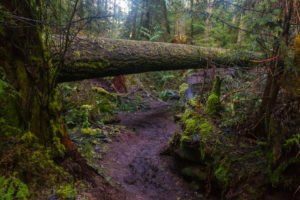 Back country hiking takes you to pristine lakes, streams, waterfalls, meadows & valleys. You may encounter some fantastic wildlife so don’t forget the camera! Guidance as well as supplies & equipment can be obtained near by for your unforgettable Montana hiking experience. Our area has some of the best winter recreational sights to be had. Cooke City has 60 miles of groomed trail and endless off trail riding, you will surely find your special place. “Steep and Deep” that is our motto, with an average of 225 inches and elevation between 7599′ and 9734′ we have powder. The Beartooth’s have another 32 miles of groomed trail and once again endless off trail. Beartooth’s get an average of 260 inches and have a elevation between 7500′ and 11000′ . Truly at the top. A 10 mile stretch of 212 from Cooke City to the Pilot and Index parking lot is closed from late fall to the first Monday of May when they start clearing the road. Park at the Pilot and Index parking lot ride west 7 miles and you arrive at the Big Moose or park at Cooke City ride 3 miles east you arrive at the Big Moose. Clean and warm cabin awaits you at arrival, from there it is a mere step out the door for your snowmobile. A true snowmobile resort.